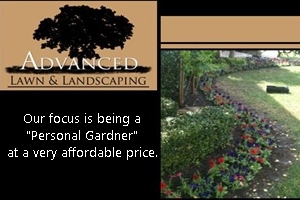 “Discover the Difference” Our focus is being a “Personal Gardener ” at a very affordable price. Our specialties are as follows, but not limited to Beds(weeding),Bushes( trimming), Flowers, Mulch & Grass installations and design, French Drains, Tree Trimming, Winter Rye Grass prep and install, Fall / Winter Leaf Service.Serving the following cities, Bedford, Colleyville, Southlake, Westlake, Grapevine, Hurst, Euless, and Northeast Tarrant county. Owner Jason Nail has more than 10 years professional experience in both Commercial and Residential Lawn Care Maintenance and Landscaping. In 2012, Jason launched his own company to address the needs expressed by clients over the years. Setting a new benchmark in professional lawn care service, resulting in high customer satisfaction. Advanced Lawn & Landscaping offers a well assembled team of professionals with a Gardner Personal Touch, taking time at each clients property at an affordable price and offers a “Client Referral” discount program.